Bluey Roberts has been painting all his life and his prolific work is appreciated in collections around the globe. 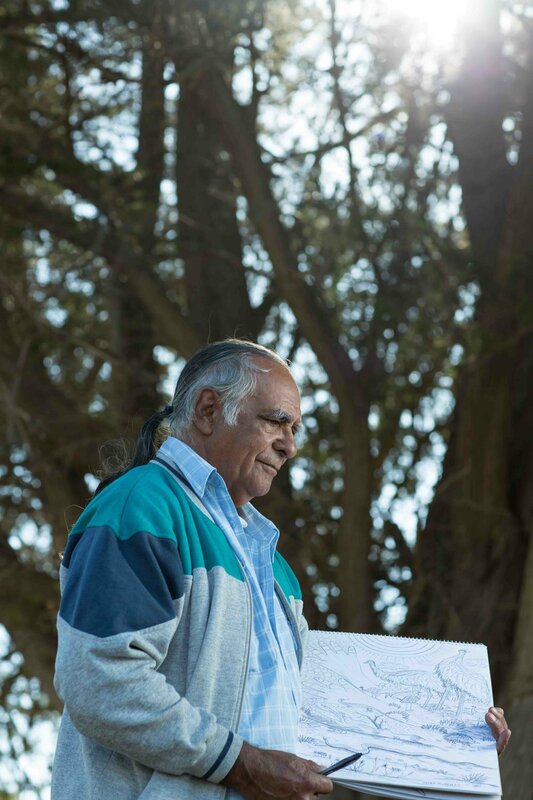 Born in 1948 in Meningie, South Australia, Bluey Roberts is of the Ngarrindjeri/ Kokatha peoples. His artistic career, spanning five decades, consists of public murals, carved and etched emu eggs, boomerangs, coolamons, walking canes and shields, and hundreds of paintings on canvas and on found and created objects. 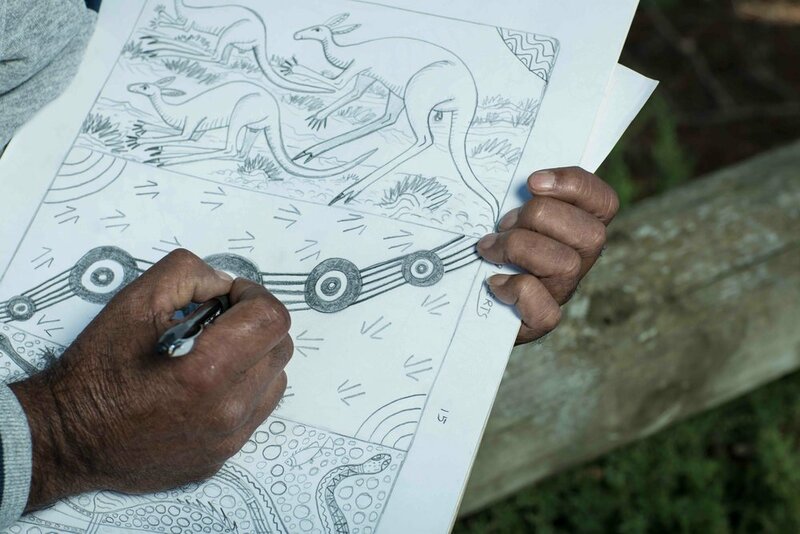 Through his art, Bluey tracks the rich diversity of animal and plant life from his homelands of Meningie and the surrounding Coorong, the upper Murray and the Murray River mouth. Bluey created and crafted the iconic welcome artwork on the footpath outside Tandanya. In 2015 he won a commission from the Adelaide City Council for a pubic art installation. He was commissioned to create a 150-meter long public work for the Port City of Mitsubishi, Japan, and for the 25th anniversary of the National Indigenous arts and culture center at Tandanya in Adelaide. 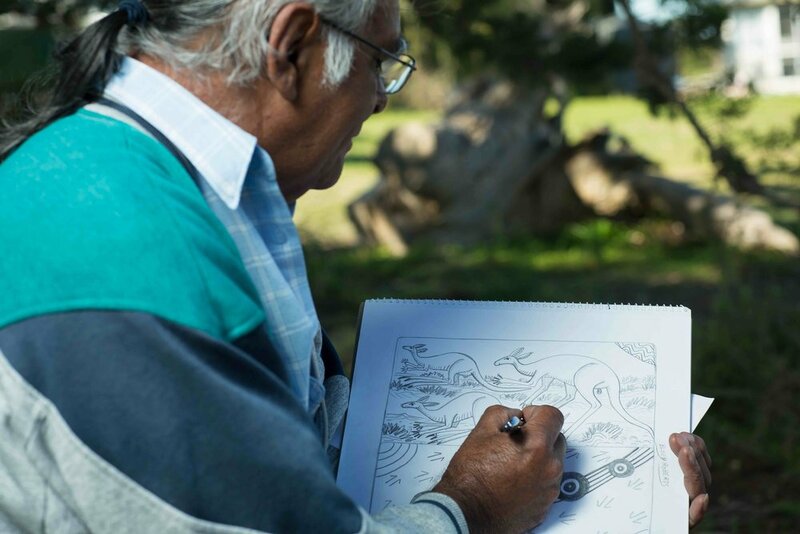 He was the first Aboriginal person in South Australia to be commissioned for a public mural in 1985, resulting in the Painted Kangaroo at the children’s section of the Adelaide Zoo. In his works, Bluey Roberts tells the story of his life, his people and their cultural traditions with a graphic style that he applies to his works. 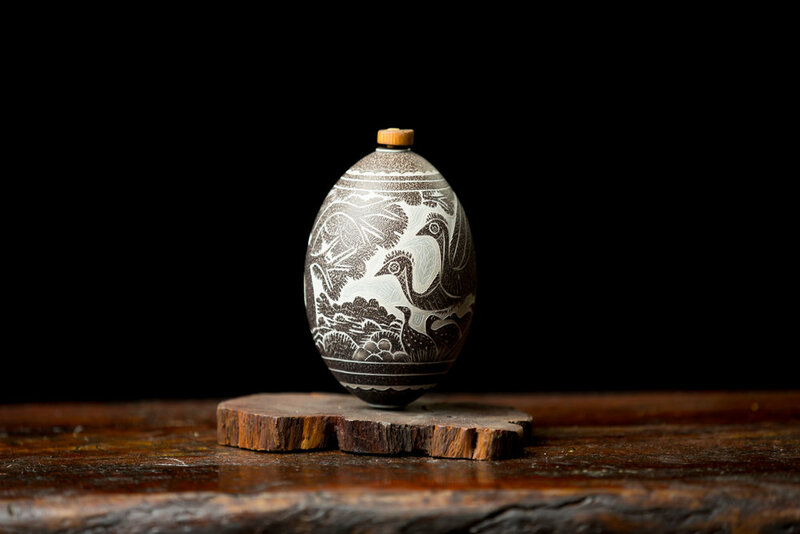 Animals feature prominently in carved wood works such as boomerangs and walking sticks, carved emu eggs and other items such as pottery. These reflect the artist’s life experiences of growing up in country where he learnt about his heritage as well as more practical aspects including hunting. 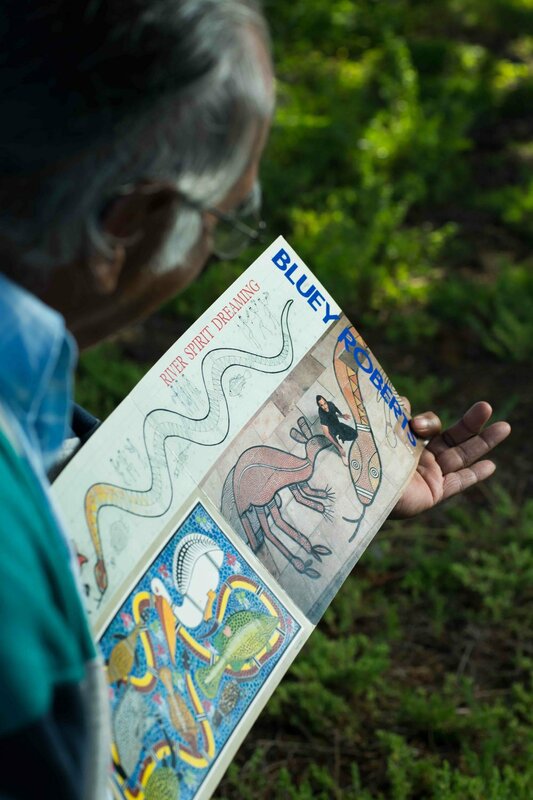 Bluey Roberts gained an understanding about biodiversity, by reading the tracks of animals and interpreting their habitats and interactions with the broader environment. He illustrates many scenes inspired by this learning. 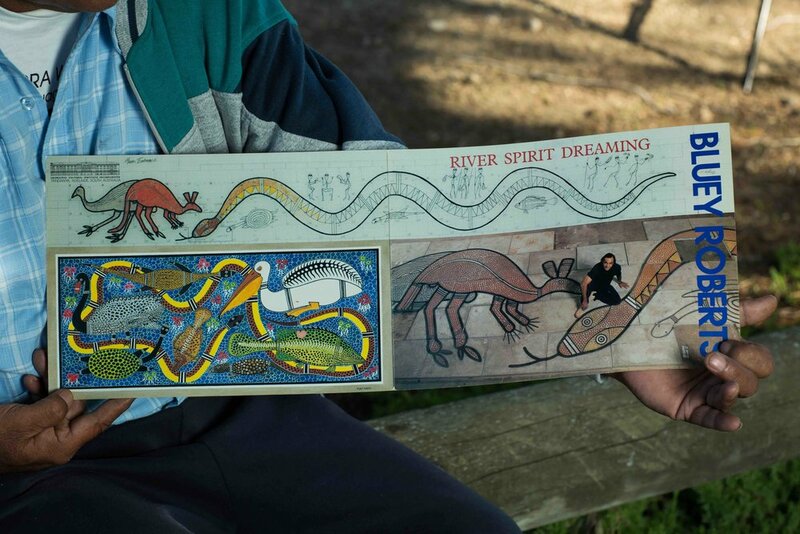 The river is a common backdrop in his art as it relates directly to the intimate connection he has with his mother’s Ngarrindjeri country, at the same time-sharing aspects of his River Spirit Dreaming. Scenes of the bush manifest also, affirming the artist’s affiliation to his father’s Kokotha country, which he travelled back and forth to as a child. Bluey Roberts’s boomerangs often utilize a relief design where animals or Ancestral figures are blackened so as to stand out from their timber grounds in relief. This article is based on an interview with Bluey in 2016, from quotes from his Flinders Museum of Art catalogue entry and from the article ‘Tracking Bluey Roberts’ by Troy Anthony Baylis.